A new Philadelphia restaurant makes soup from leftover chicken and donates 100 percent of its profits to a nonprofit fighting hunger and homelessness. Restaurant obsessives around the country turned their eyes to Philadelphia one day in late January for the eagerly anticipated opening of Rooster Soup Company, a diner in the heart of the city that specializes in soups including smoked matzo ball and mushroom barley. It wasn’t just because Rooster Soup is another project by powerhouse restaurateurs Steven Cook and Mike Solomonov, whose restaurant group CookNSolo birthed the modern-Israeli fine dining wonder Zahav and the fried chicken and doughnuts chain Federal Donuts. Instead, people paid attention to Rooster Soup because it is donating 100 percent of its profits to the Broad Street Ministry, a local non-profit that fights hunger and homelessness. It’s a bold philanthropic model, to be sure. Other restaurants around the country offer pay-what-you-can-style service or donate a portion of their profits, but few if any others go as far as Rooster Soup. Still, the people behind it argue that the groundbreaking element of Rooster Soup is not necessarily the generosity of the restaurateurs or the enthusiasm of its supporters—exemplified in part by the more than 1,500 backers who shelled out $179,380 for Rooster Soup’s Kickstarter campaign in June 2014. Rather, it’s the hope that this model will demonstrate what’s possible when for-profit businesses and nonprofit organizations join together. In the spring of 2013, Steve Cook had two problems. Federal Donuts had proven so successful that he and his partners were planning to open a commissary to break down more chicken into breasts, thighs, and drumsticks more quickly. But with that would come more food waste—some 500 pounds of spare chicken backs and other parts each week. Cook didn’t know what to do with the excess, but he knew he didn’t want to just throw it away. Around that same time, Broad Street Ministry had approached Cook to join its hospitality advisory board. The church practiced something called “radical hospitality,” opening its doors to Philadelphia’s most vulnerable to serve them hot meals complete with waiters, tablecloths, and even a maître d’. This wasn’t the transactional model of hospitality to which Cook was accustomed, but he took to it immediately. He began bringing in his staff at CookNSolo to volunteer with the ministry every few months and offered the nonprofit practical advice on how to hire a head chef. But he wanted to do more. Meal service at Broad Street Ministry. Photo Credit: Getty Images/Spencer Platt. Several weeks later, Cook realized his two problems had the same answer: soup. Federal Donuts could make soup from its discarded chicken parts and bring that to Broad Street Ministry. Solomonov, his partner and the acclaimed chef at Zahav, agreed, believing in soup’s therapeutic benefits. Figuring it would be an easy win for both their chicken chain and the nonprofit, they approached Golderer with the idea. “Bill hated the idea,” Cook said, laughing. And he really did. Golderer remembers telling Cook and Solomonov that day how their idea, while appreciated, was not was Broad Street Ministry was about. You have to descend a few steps to enter Rooster Soup Co.’s new digs, just a block away from the Center City outpost of Federal Donuts. The place exudes a retro diner vibe, with burgundy booths and chrome stools lining a long white counter. Founded in 2005, Broad Street Ministry has always had high aspirations as an advocate for the homeless. A Presbyterian minister, Golderer saw that standing in line at a soup kitchen, never knowing if there would be enough to eat, made people wonder if they mattered. So he built a community that would underline that they do. Golderer created a hospitality advisory board full of pros like Cook, hoping they would buy into the ministry’s mission. It turned out to be a smart gambit: Broad Street Ministry has now become a favorite charity in the Philadelphia hospitality industry—many of the city’s hoteliers and restaurateurs volunteer there and refer their employees and guests as well. Golderer was ready to take these partnerships to the next level. So when Cook and Solomonov approached him about donating soup, he countered with an idea of his own: Instead of giving soup away, he asked, what if they packaged and sold that soup to wealthy people who want to feel good about what they’re eating? Crowdfunding startup capital was essential to the restaurant’s plan. Though a few donors had promised to kick in a total of $100,000 if the Kickstarter was fully funded, most investors expect to see returns that they weren’t going to get with Rooster Soup Co. Early on, Cook said, the partners had decided that taking profits for themselves or their investors was a slippery slope. After expenses like food, labor, rent, and utilities, they pledged to donate 100 percent of the profits to the ministry. It’s too early to know how much that profit will be, but Cook estimates it could be hundreds of thousands of dollars, which would ease the fundraising burdens it faces each year. “Either we’re geniuses or complete idiots,” Cook said. But the fundraiser made clear that people really do want to eat at a profit-nonprofit restaurant. Some of Rooster Soup Co.’s soups: Smoked Matzoh Ball, Beef & Vegetable, Roasted Cauliflower, Mushroom & Barley. Credit: Michael Persico. Erin O’Shea, a partner at CookNSolo, may be more excited than anyone about the new enterprise. She’s the head chef at Rooster Soup Co., where the menu perfectly fits what Cook calls her “straight-up delicious without being fussy” cooking style. But O’Shea is mostly fired up for Rooster Soup because of what it means for the community. Others are too, she said. In the restaurant’s first week, some of the city’s big-name chefs came in to dine—one chef even offered to help out in the kitchen. Purveyors have helped her out with food costs. And diners have shown up. “They’re happy walking in the door because they know what’s up,” she said. 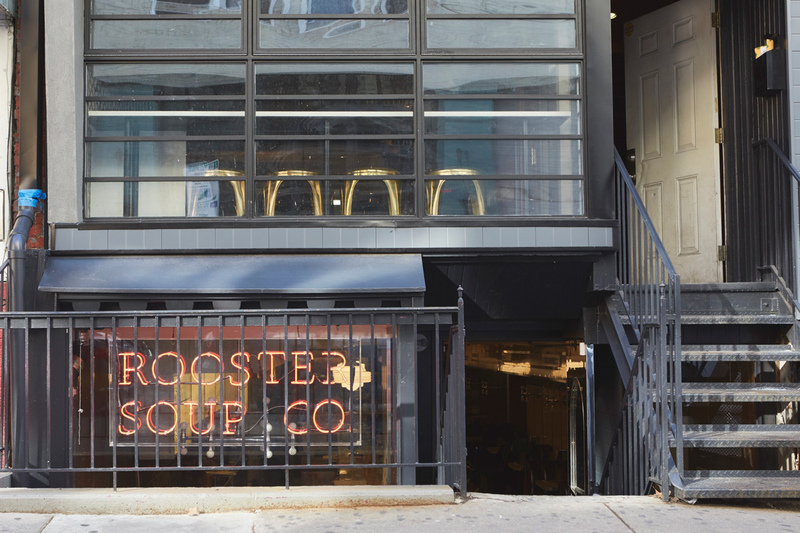 Though it’s still too early to say for sure, Rooster Soup Co. may eventually expand its social agenda, whether by using “ugly food” to further reduce food waste or starting a job-training program for the underemployed. The point, the partners say, is to imagine the possibilities that can stem from a “virtuous cycle” between businesses and charities. “By making this a profitable restaurant and a successful restaurant, you’re making the case that we’re all living in one Philadelphia and we all have an opportunity to make it better for everybody,” Golderer said.